The article is rife with false claims and factual errors, which I will attempt to address here. Why am I writing a rebuttal to a 7-year-old article? Natural News has a huge following, with over 2.9 million people subscribed to their Facebook page at the time of this writing. The article also appears in Google search results. Sadly, it is quite possible that cancer patients will come across this article and be utterly misinformed about what treatment options are most effective. This can have potentially deadly consequences for the patient if conventional treatments are delayed or forgone. Misinformation, in this case, can kill. Finally, as a radiation oncology physicist, I am in a unique position to educate people in order to set the record straight. Adams continues on in a downward spiral of conspiracy theories, claiming that radiation therapy is a scam and just a big con by the cancer industry and “BigPharma” to make money with complete disregard for patients. The Health Ranger makes a number of mistakes, the largest one being that the lethal dose he has quoted is for a whole body dose. A radiation dose to the whole body results in different outcomes compared to the same radiation dose delivered to a specific, targeted region of the body. Generally when radiation therapy is used to treat cancer, the cancer professionals go to great lengths to focus the radiation dose on the tumour, and in some cases they will also target other tissues where it is suspected the cancer might spread. Therefore, the doses quoted by Mike Adams are of little relevance to the type of targeted doses delivered with radiation therapy. Another mistake made by Adams is the omission of dose fractionation. If you or a loved one have undergone radiation therapy, it’s likely that the treatment involved multiple visits to the hospital – in many cases, over the course of several weeks. This is because radiation therapy is not given in a single large dose, but rather it is administered in many, smaller doses or fractions. Reasons for this are based on the extensive research that has been done on the effect of radiation on cells – a field known as radiobiology. In short, allowing time between radiation treatments enables radiation to kill tumour cells while permitting healthy cells to repair and repopulate themselves. So a radiation dose delivered all at once will have a much different effect than the same dose delivered over multiple fractions. For this reason, Adams’ alarmist approach is just misinformed. Radiation oncologists and researchers go to painstaking lengths to study the effects of different fractionation schedules with rigorous and carefully designed scientific studies – all in order to discover which treatments have the best chance of either curing patients or extending their lives. Toward the end of the article, the Health Ranger marches on by claiming that small doses of radiation actually cause cancer. He is actually correct in that delivering radiation to healthy tissues can increase a patient’s long-term risk of developing cancer. In radiation therapy, some healthy tissues must be irradiated in order to deliver a radiation dose to the tumour, so one potential side effect is that many years after the treatment, the patient could develop what is known as a secondary cancer. So why do we deliver radiation for cancer? Because like any treatment, the benefits and risks of the treatment have to be weighed and considered. If radiation can destroy a tumour that is an imminent threat to the patient’s life, then that benefit outweighs the slight increase to the patient’s long-term cancer risk. The internet is awash with alternative cancer treatments that claim to cure cancer with little to no side effects, but these treatments have no side effects because they are not effective. If they were effective, they would simply cease to be alternative and become the standard of care in conventional medicine. There are other mistakes made by Adams in the article, but the ones listed above are the most egregious. The bottom line is that radiation therapy is administered the way it is because there is a wealth of evidence to support its effectiveness for the treatment of cancer. If I was a cancer patient, I wouldn’t hesitate to accept the treatment plan recommended by my physicians. It is tragic that the type of misinformation peddled by the likes of Mike Adams have, and will continue to have, devastating consequences for cancer patients and their families. When sharing an article on social media that is critical of a particular “alternative” treatment, I often get responses from friends and family that appeal to anecdotes in order to argue that the treatment is effective. These may include stories they have heard from others or a story of their own personal experience with the treatment. In some cases, the objections are defensive in tone. After all, who are scientists to dismiss the personal experiences of others? Do scientists think these people are untrustworthy? Do they think that these people are lying? Do they think that these people are stupid? Are scientists just arrogant and pretentious jerks who dismiss these claims because they don’t want to be told they’re wrong? These defensive objections are certainly understandable. The experience of feeling better after a treatment can be incredibly compelling – to the point that it feels completely obvious that the treatment was effective. Hence, it seems only natural to take offense when scientists refer to these anecdotes in a pejorative manner. Why do scientists react this way? Do you want to believe things that are most likely to be true? If you currently hold a belief that isn’t true, would you want to discover that? If your answers to either of these questions is “no”, then stop reading right now. There are two problems with the logic used in the above arguments. First, consider the argument “how could so many people be wrong?” This argument appeals to the popularity of a belief, arguing that if a large number of individuals hold the belief, then that belief is more likely to be true. In fact, this is untrue. The popularity of a belief is not a justifiable reason to conclude that the belief is true. This is a logical fallacy known as the appeal to popularity. There are countless examples in history where a large number of people believed something that turned out to be untrue. More importantly, the bigger problem has to do with the logical fallacy known as post hoc ergo propter hoc, which I discussed in a previous post. In short, the anecdotes claiming that alternative treatments are effective are largely based on the fact that a positive outcome was observed following the administration of the treatment. As such, the fallacy here is the conclusion that the positive outcome must have been caused by the treatment because it followed the treatment. Apart from logical fallacies, there are a number of reasons why scientists consider anecdotes to be unreliable. Regression to the mean is the scientific way of saying that when things move toward one extreme or another, that over time, they tend to trend back toward the average. For example, imagine you are sick with a cold but you feel better again after 10 days without taking any medication. You moved toward a state of being sick, and then trended back toward the average of feeling normal. Consider an alternate scenario: you are sick for the same amount of time, but you decide to take some cold medicine on the 9th day and you feel better the next day. Did the cold medicine cause you to feel better, or would you have gotten better anyway? There is simply no way to know based on this evidence alone. Therefore, this anecdote is not a reliable way to believe what is true. To the person making the claim that an alternative treatment helped them, it may seem like a cop-out to say that it was a coincidence. However, a basic consideration of statistics and probability tells us that with large numbers of random events, some coincidences are expected. Humans are generally terrible at comprehending large numbers and intuitively understanding randomness. For example, think of a random sequence of ten digits between 1 and 10. Chances are that the sequence you thought of is not truly random. Experiments of this sort have shown that we tend to underestimate how often two or more identical numbers will follow each other in a truly random sequence such as this one. A good example is the case of vaccines and autism. Given the many millions of vaccine doses administered and the high frequency of autism, statistics tells us that we would expect a pretty significant number of children to begin showing signs of autism around the time a vaccine is given. It would be incredibly odd if there were no coincidences. Based on this information alone, there is no reliable way to determine whether or not there is a causal connection. This is why scientists are not persuaded by the anecdotes of parents who claim vaccines caused their kids’ autism. Unfortunately, many parents lack an understanding of statistics and they come to the erroneous conclusion that scientists are heartless shills. Humans tend to focus on unusual, interesting events while ignoring mundane ones. This is why we don’t see headlines such as “Man drives to work without getting into a car accident” and “Local couple flies across the country without incident.” Thus, anecdotes tend to focus more on these unusual events and the result is that studies have shown that we tend to overestimate how common these events actually are. Let’s say that 100,000 people have a particular type of terminal cancer and someone invents an untested alternative treatment for this cancer. All 100,000 people try the treatment, 4,000 people go into remission, and 96,000 pass away. Following these events, we now have 4,000 people providing testimonials that this alternative treatment cured their cancer. Should we accept these testimonials? Well, consider that diagnostic tests for cancer are not perfect, and some percentage of patients will be a “false positive,” i.e. diagnosed with cancer even though they don’t have cancer. In this example, if the false positive rate for this cancer was 4%, we would expect 4,000 people to not have cancer in the first place – the same number of people who are now providing testimonials. The lesson here is not that the claims of anecdotes are necessarily wrong, but simply that anecdotes alone are not a reliable way to determine whether or not a treatment is effective. If someone takes multiple treatments at the same time, it is not possible to know which treatment (or combination thereof), if any, caused the positive outcome based solely on an anecdote. For example, let’s say someone has a condition and they begin taking three different supplements at once. Then, their condition gets better and they become convinced that a particular pill caused the improvement. They then begin to tell their friends, so convinced that this one pill made them better that they omit the fact that they also took other supplements. Based on their anecdote, there is no way to be sure that other factors weren’t involved. This phenomenon has been observed in some cancer patients who claimed that an alternative treatment cured them. Upon further investigation it was then revealed that the patient was taking other conventional treatments at the same time, any of which may have been the cause of the remission. Experiments have shown that believing or not believing in the effectiveness of a treatment can have real physiological effects in the body and that the more invasive a treatment is perceived to be, the stronger this effect. For example, placebo experiments have shown that two placebo pills are more effective than a single placebo pill, that placebo injections are more effective than placebo pills, and that placebo (sham) surgeries are more effective than injections or pills. This may seem completely counter intuitive, but it is a real, demonstrated effect that scientists are attempting to understand. Therefore, when you feel like an alternative treatment worked for you or a friend, it may very well be due to the placebo effect, and not a product of the treatment itself. 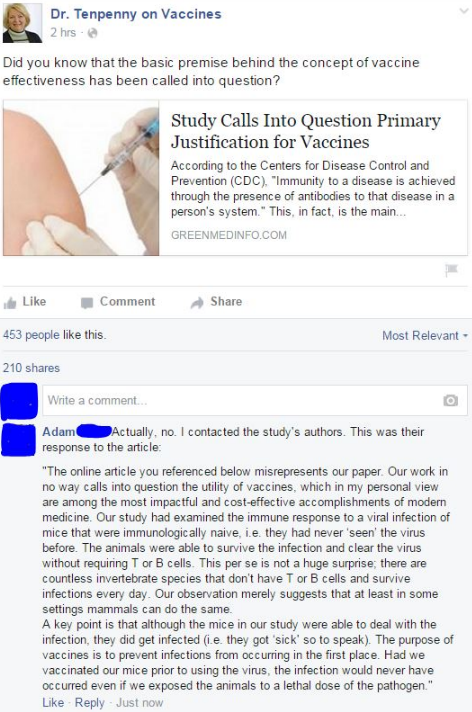 Hence, there is no way to know if the treatment itself actually worked based solely on an anecdote. When a scientist dismisses your anecdote, it’s not because they think you are stupid, untrustworthy, or uneducated. It is because they are astutely aware of the limitations of anecdotal evidence, and they know that more rigorous, high quality studies that control for confounding factors and biases are required in order to verify a claim. They are simply doing what they have been trained to do, and it is likely not a personal judgment about you. If you want to believe true things, be skeptical. The next time you’re tempted to come to a firm conclusion based on a personal experience or a friend’s anecdote, ask yourself how reliable that anecdote really is. 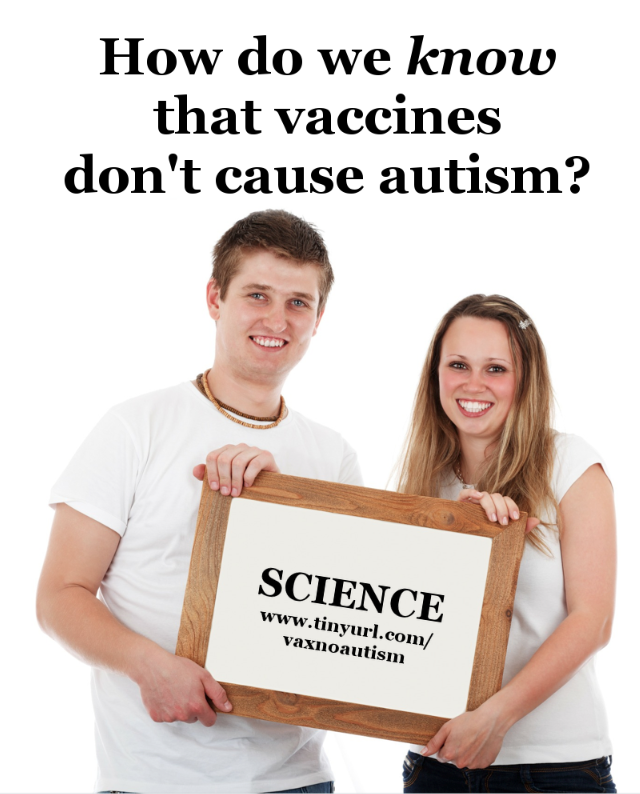 The evidence is overwhelming: vaccines are not associated with autism. Next time somebody says that vaccines cause autism, or that the link has not been studied extensively, hit them with this list of 99 scientific papers (including studies and reviews) showing no link between vaccines, vaccine ingredients and autism. Compiled by Nathan Boonstra, Allison Hagood, Luci Baldwin and myself. I spend more time than I care to admit having online debates with people. Recently, I was having a discussion with a mother about the Vaccine Adverse Event Reporting System (VAERS). She was of the opinion that vaccines cause a wide range of things such as autism and death. She argued that all of the reports of adverse events in VAERS were a cause for concern and she seemed to be under the impression that VAERS is a reliable way to establish a causal connection between the vaccine and the reported adverse event. Her logic was that since the CDC (and the FDA) manages VAERS, they are vetting the submitted reports based on quality and hence the reports in its database are reliable. In particular, she was concerned about the Gardasil HPV vaccine and wanted to delay her daughter’s vaccination. To determine whether VAERS is reliable for determining causality, let’s look at what it is. Why does VAERS exist? In 1986, the United States passed the National Childhood Vaccine Injury Act, which requires health professionals to report any adverse event that may be suspected of being caused by an administered vaccine. In response to this bill, the CDC and the FDA established VAERS in 1990. This is a good thing and certainly favorable compared to having no system in place to report potential adverse events. A consumer reported that he/she read an [sic] internet concerning a female who on an unspecified date was vaccinated with a dose of GARDASIL (lot # , dose and route not reported). On an unspecified date, the patient died of “clot blood” eight hours after vaccination. This is one of several reports from the same source. No further information is available. There are other sad stories within the data, including a girl dying on a lacrosse field from cardiac failure and a son who committed suicide by hanging himself. These reports are quite grave and it’s understandable that if someone believes these are legitimate reports investigated by the CDC for quality and causality, that person would certainly be inclined to be concerned about the Gardasil vaccine. Therefore, it’s important to determine whether the CDC is actually determining causality from these reports. When evaluating data from VAERS, it is important to note that for any reported event, no cause-and-effect relationship has been established. 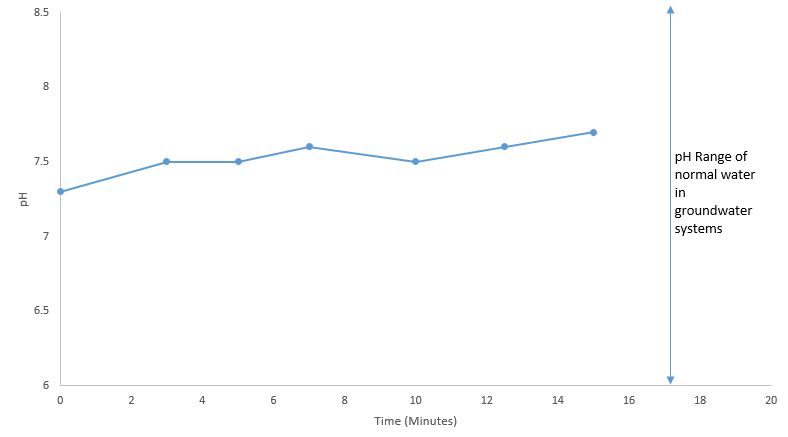 […] VAERS collects data on any adverse event following vaccination, be it coincidental or truly caused by a vaccine. The report of an adverse event to VAERS is not documentation that a vaccine caused the event. […] VAERS reports can be submitted voluntarily by anyone, including healthcare providers, patients, or family members. Reports vary in quality and completeness. They often lack details and sometimes can have information that contains errors. […] A report to VAERS generally does not prove that the identified vaccine(s) caused the adverse event described. 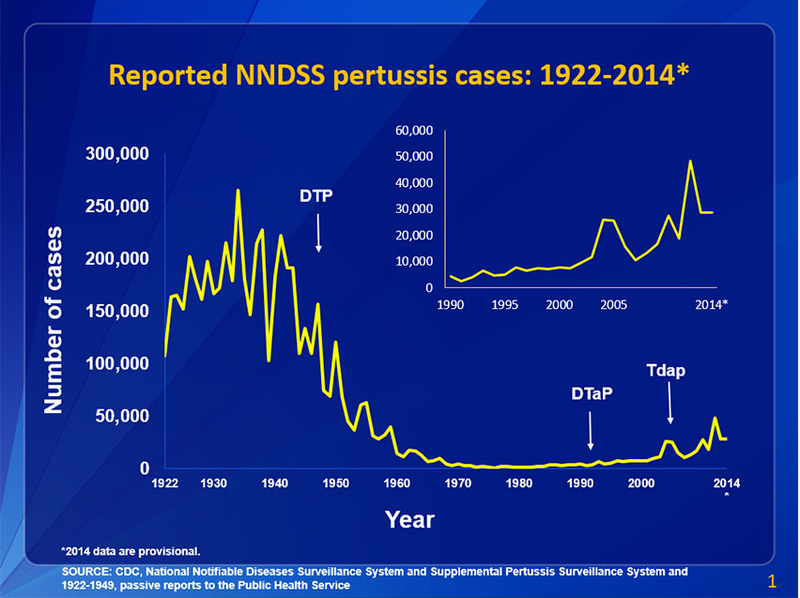 It only confirms that the reported event occurred sometime after vaccine was given. No proof that the event was caused by the vaccine is required in order for VAERS to accept the report. VAERS accepts all reports without judging whether the event was caused by the vaccine. Anti-vaccine advocates often cite VAERS data as evidence that vaccines cause autism. The amount of cognitive dissonance that is required in order for them to click this button must be astronomical. I suspect the person with whom I was debating never tried to access the data from the VAERS website. If she did, she must have not read or ignored this disclaimer. Whenever VAERS evidence is cited to “prove” some sort of adverse event, that person is falling prey to the logical fallacy known as post hoc ergo propter hoc. (I covered this in a previous post.) In short, an adverse event occurring after vaccination does not prove that the vaccine caused the event. This fallacy seems lost on many anti-vaccine advocates, as they cite VAERS as a reliable way to determine that vaccines are dangerous. I could list thousands of other instances of anti-vaxxers invoking the VAERS database as reliable evidence, but it would take an inordinate amount of time and I think you get the idea. In short, the data in VAERS is not reliable for determining causality. The fact that some individuals continue to view it as reliable is a result of confirmation bias combined with post hoc ergo propter hoc. 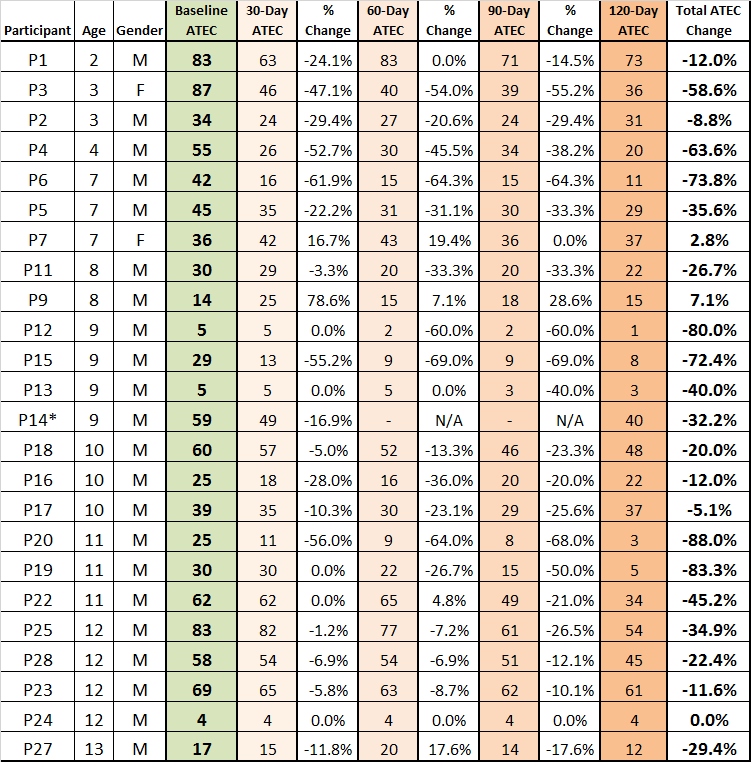 It should be noted that another argument used by anti-vaccine advocates to make the VAERS data appear more alarming is to point out that VAERS suffers from under-reporting. This is true with any passive reporting system. For example, many adverse events such as swelling at the injection site are likely to not be reported. However, this argument is a non-sequitur, i.e. an argument in which its conclusion does not follow from its premises. The fact that some adverse events are not reported is completely irrelevant when it comes to determining causality. If all of the events were reported, we would simply be left with a larger sample of events from which we cannot reliably determine causality. So why bother having VAERS when it is not a reliable way to determine causality? The answer is that VAERS is a kind of early warning system. If there are many reports of an adverse event, then researchers can conduct higher quality studies in which confounding factors are controlled for in order to determine whether the event is actually being caused by the vaccine. This makes sense – remember that to avoid falling prey to the post hoc ergo propter hoc fallacy, higher quality evidence must be considered. In this regard, VAERS has been successful in the past. For example, in 1999, there were many reports in VAERS of intussusception occurring after administration of the rotavirus vaccine RotaShield. Further studies were conducted which confirmed the increased risk and this data led to the subsequent removal of the vaccine from the US market. In another instance, VAERS determined that there was a high incidence of Guillain-Barré syndrome occurring as a result of the meningococcal conjugate vaccine, Menactra, and further controlled studies are underway to investigate the issue. Finally, the inconsistent logic of anti-vaccine advocates must be highlighted. These individuals often dismiss any information about vaccine safety provided by the CDC because they believe the CDC to have ties to pharmaceutical companies. (The Shill gambit.) Yet they don’t hesitate to cite reports from VAERS as reliable evidence, despite the fact that VAERS is sponsored by the CDC. Basically, they ignore the CDC information that goes against their beliefs and deem CDC information that supports their beliefs to be irrefutable. Once again, confirmation bias reigns supreme. So whenever you hear a passionate argument from an anti-vaccine advocate who cites VAERS as evidence that a vaccine caused an adverse event, remember the limitations of the VAERS data and recognize that we need higher quality evidence in order to come to this conclusion. Anecdotes of “Vaccine-Injured Children” – What Can They Really Tell Us? If you’re familiar with the information provided by anti-vaccine websites, then you have probably encountered some anecdotal (word of mouth) accounts of children getting injured by vaccines. The story usually goes something like this: a child receives one or more vaccines and then within a short time frame after vaccination, the child experiences an adverse event. Examples of some of these stories include sudden infant death syndrome, autism, and others. My heart goes out to the parents of these children. To some, this may come across as a disingenuous sentiment from an internet blogger. However, the truth is that a member of my immediate family has autism and I have witnessed firsthand, for over two decades, some of the challenges that parents may face following such a diagnosis. I have also experienced a variety of challenges as well. These anecdotal stories can be incredibly alarming to the well-meaning parent that is trying to decide whether to vaccinate their own child, or to the parent trying to determine whether a vaccine was the cause of their child’s ailments. The end result is that many parents could come away with the impression that vaccines are unsafe and potentially life-threatening. It is certainly understandable that parents might associate an adverse event with a vaccine if these two occur around the same time. What is crucially important, however, is how reliable this temporal (timing) correlation of events is in terms of informing us as to what is true. Can this evidence reliably tell us whether there is a causal relationship between the two events? Let’s consider the example of the measles, mumps, rubella (MMR) vaccine and autism. Although there is a lot of other evidence on this topic, for now, I am only interested in looking at the temporal coincidence of events and determining what this specific evidence can tell us. Every year, roughly 4 million children are born in the US. It is estimated that the current rate of autism spectrum disorder (ASD) is about 1 in 68. So every year there are over 58,000 children diagnosed with ASD, which amounts to an average of approximately 160 children diagnosed with ASD every single day. On average, children are diagnosed with ASD around the age of 4, but signs of ASD can be noticed by parents as early as before the 1st birthday. 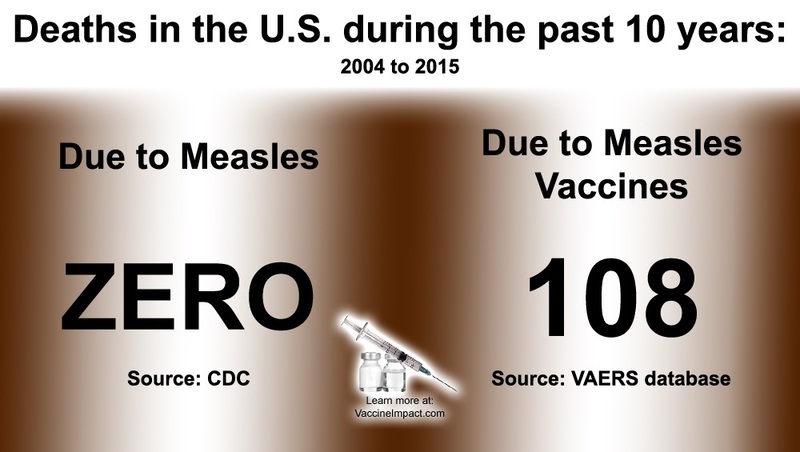 The vaccination schedule in the US recommends a first dose of MMR at 1 year of age and a second dose at 4-6 years. Armed with this information, imagine a 6-year calendar (or 6 normal calendars linked together) that represents the first 6 year span of children’s lives. Next, populate that calendar with dots representing the time at which children are diagnosed with ASD. As mentioned earlier, the average rate is 160 per day, so each day on the calendar needs on average 160 dots. Now, children aren’t very likely to be diagnosed in the first few months, so move those dots to a later time in the calendar. For simplicity, let’s assume that all the kids’ parents follow the recommended schedule and give the first dose of MMR on their first birthday and the second dose on their 4th birthday. Snapshot of a 2 week span in the calendar. One dot represents one ASD diagnosis on the given day. Is it possible to determine which dots are coincidental and which are not? 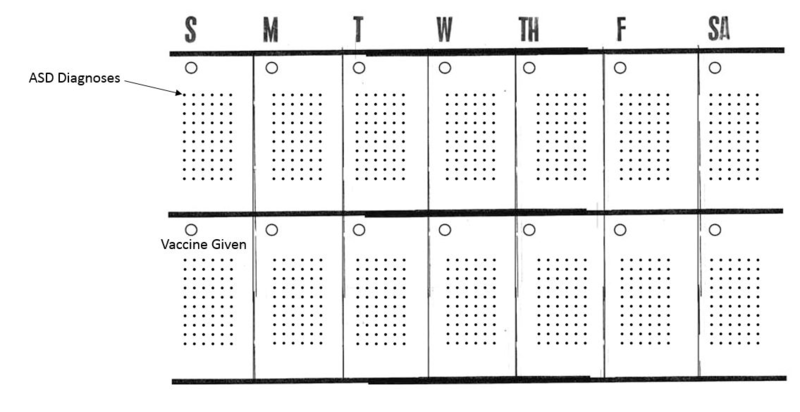 With this calendar in mind (marked with dots representing ASD diagnoses and two vaccine dates marked), is it possible that there are dots that happen to fall on the vaccination days, or within one week of vaccine administration? Given the large number of dots, basic statistical probability would say that it is extremely likely that some dots will fall after vaccine administration. 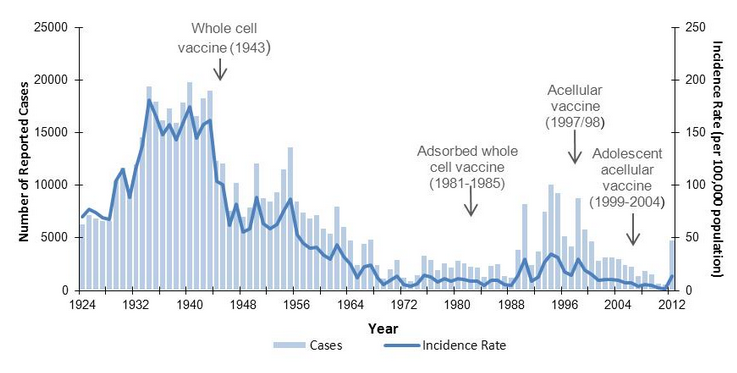 In other words, it would be extremely unlikely if there were NO dots following the vaccination days. Given this, it is very likely that we will have some coincidences in timing between some ASD diagnoses and vaccination. This doesn’t mean that those dots are absolutely coincidences, but the simple truth is that based solely on this evidence, there is simply no way to determine which dots are coincidental, if any, and which dots might be due to the vaccines, if any. This may seem like a somewhat contrived example, but the truth is that one can set it up however they like and the main conclusion is unchanged. We could add or remove vaccines, increase or decrease the number of diagnoses, change the length of the calendar, change the vaccine type, change the adverse event from autism to death or something else. We could even change the distribution of dots so that more dots are clustered around one time compared to others. No matter what, there is just no reliable way, based solely on this evidence, to be certain as to whether the adverse event is causally associated with the vaccine. We cannot separate the coincidental events from the causally associated ones. In order to do this, we need more evidence. We also need more evidence in order to answer questions such as: How many children that received the MMR were diagnosed? How many children that did NOT receive the MMR were diagnosed? Is there a significant difference between these two groups? Unfortunately, instead of being skeptical and asking themselves these kinds of questions, many parents will understandably fall victim to a logical fallacy when faced with these kinds of vaccine injury stories. They may also fail to recognize that any emotional attachment to their belief, while being completely normal, has no influence on the truth. Concluding a causal relationship based on succession of events is known in philosophy as a logical fallacy called post hoc ergo propter hoc, or post hoc fallacy for short. It is a logical fallacy that states “Since event Y followed event X, event Y must have been caused by event X.” For more on this, Paul Henne, a philosophy graduate student at Duke University, has a great video with further explanation. If case 1 is sufficient evidence to assume causation, then case 2 must be sufficient as well. Clearly, this logic is inconsistent because it leads us to contradictory conclusions when both cases are considered. Sadly, many well-meaning parents in the anti-vaccine movement fall prey to this logical fallacy. So from now on, if you hear about someone referring to their “vaccine-injured” child, remember that they are likely coming to this conclusion based on a succession of events and that in order to determine what is really true, we need to be skeptical and consider higher quality evidence.